Costa Rica is determined to be the first carbon-neutral country in the world by 2021. On the winter break trip students will focus on the country’s initiatives in social responsibility, sustainable development, biodiversity with an emphasis on monkeys and rainforest ecosystems, indigenous community, and mitigating the effects of global warming. We will explore everything from ant farms to rainforest medicines, from volcanoes to beaches, from exotic birds to gulch-spanning ziplines, from crocodiles to frog ponds. In Guaria de Osa, Albergue El Copal and the CATIE Institute, students will work on service-research projects alongside local ecotourism directors, farmers and scientists who are working in cooperatives and research institutes that benefit both entrepreneurs and the local community. Make an educated decision! 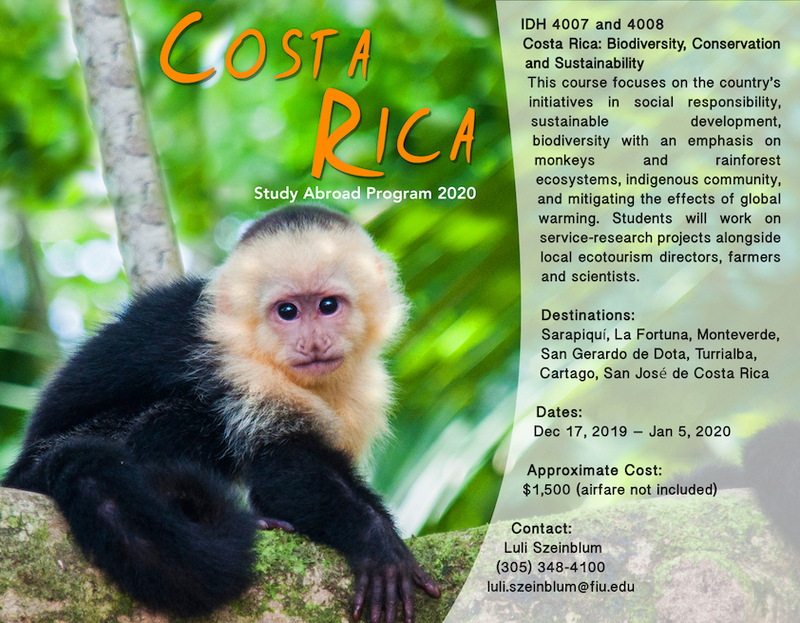 Check out the March 20, 2019 Study Abroad Honors Hour on the Costa Rica program HERE! Sustainability, culture, and biodiversity. The impact of economic, environmental, and social issues related to tourism and general business practices. Activities: maintaining forest reserve and hiking trails, working on cooperative farms, harvesting crops, visiting and talking with members of indigenous tribes and assisting local people in launching sustainable tourist facilities. Also, you will explore the rich and diverse ecological landscape through boat rides, bird watching, nature walks, snorkeling, swimming and zip-lining. You will also perform approximately 30 hours of service work in a rural community field stations and on cooperative farms where families live and work together for a common cause. Indigenous traditions, community tourism, conservation, sustainable medicinal plants, unique ecosystems, the cooperative model and its social/economic impact. Great for students with interests in environmental studies, biodiversity, economics, ecology, anthropology, sociology, agriculture, business, tourism, medicine, pharmacology, religious studies, engineering, biology… There is something for everyone! There is a fall course component (3 credits.) Classes start this fall. The trip is during winter break (3 credits.) These 6 credits fulfill one year of Honors College requirements. Dr. Sian Evans – sevans@fiu.edu. Born and educated in the United Kingdom, Dr. Sian Evans holds a Master’s degree in Biological Anthropology from the University of Durham and a Ph. D. from the University of Wales. She has lived and worked in Gabon where she helped raise orphaned gorillas. In her former position as the Managing Director of the DuMond Conservancy for Primates and Tropical Forests in Miami, she conducted research on nocturnal owl monkeys and now serves as a full-time instructor in the Biological Sciences Department and Honors College of Florida International University. Along with collaborating on conservation projects in Colombia, Dr. Evans helped establish a field school at La Suerte Biological Station in Costa Rica. She was the founding Vice President for education for International Primatology Society, and in 2012 received the President’s Medal from the American Society of Primatologists for her unique and outstanding commitment to the field of primatology. After you’ve secured your spot at DM 233, make your three payments… change to: After you’ve secured your spot at DM 233, make your 3 payments at Student Financials (SASC Building 1st Floor.) In order to make sure the payment goes towards the program and NOT to cover other balance you may have, we strongly recommend you pay in person. Make sure to tell the cashier you are paying your Honors Study Abroad program, and which one is it (E.g. Honors Japan program, Honors UK program, etc.) The charges will be posted to your my.fiu.edu account approximately 21 days prior to the deadline or earlier.